No recipe really, simply layer strawberries, raspberries and blueberries, with Bisquick shortcakes in a jar and top with whipped cream! Happy 4th of July!! Follow the instructions on the Bisquick box for shortcakes; bake and cool completely. In a large bowl, gently toss berries with 2 tablespoons sugar. 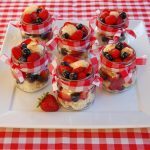 Layer berries and shortcake in jars and top with whipped cream. Enjoy!